NEW!!! Ready to Bake FRESH Poppy Seed Filling - 40 oz. Poppy seed filling - ground, sweetened poppy seeds. Ideal for fancy, elegant baked goods. Delicious in cookies, cakes, and pastries. 1 lbs. Package (12.75/lb.) $12.75 ea. 16 oz. 5 lbs. Package (9.75/lb.) $48.75 ea. 80 oz. Otto's delicious fresh out-of-the barrel poppy seed filling is a delight! Made to perfection and ready for baking. No grinding needed. Perfect for: Strudel, Kifli, Beigli, Poppy seed roll, Kolache, Hamantaschen, Potica, Babovka, or other delicious dessert recipe items needed for sweet poppy seed filling. In a re-sealable plastic container. (Mák frissen darálva - ) $ 10.95 / lb. and placing in the freezer. [ ] Un-ground Poppy Seed (Mák) $ 9.75 / lb. Grind on site and make the freshest filling! "2nd Day Air" or "EXPEDITED"
The quicker the shipment, the sweeter the ground poppy seed. UNGROUND Poppy Seed does not require fast shipping. These tiny blue-black seeds have a distinctive affiliation with eastern Europe, perhaps because that corner of the world has nurtured them the most. Best described as nutlike and a little dusty, their flavor is distinctive but not strong, and the crunchy texture is very attractive. Poppy seeds, good in both sweet and savory dishes, are most flavorful when roasted and crushed to release the flavor. Use them in cakes, cookies and breads, and on noodles. Poppy seeds on a bagel make a terrific contrast of texture, taste, and even appearance. Otto's selects, sells, and imports the best poppy seed. Baking Tip: For storage, you are welcome to freeze ground poppy seed. Just add 1/3 powdered sugar for freshness. [ ] $ 5.95 Solo imported filling. Great for desserts or baking. continue to be a favorite in every bakers' kitchen. airtight vacuum sealed containers to ensure quality and shelf-life. to fill your cookies, cakes and other dessert items. Hot or cold, Solo fillings are ready to go! 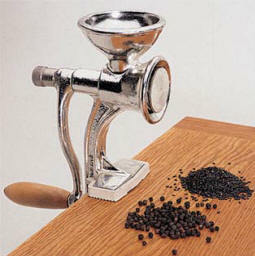 You may grind fresh poppy seed to create a perfect consistency. The grinders come in two styles, each with an easy grip handle and sturdy clamp. "Grind right before you are ready to bake." This durable grinder can grind other seeds: peppercorns, spices, coffee and some nuts. Imported from Hungary! Choose from several different flavors! Each wrapped in beautiful colored foil! "Szaloncukor" is the magic behind a beloved Hungarian Christmas tradition. These white-fringed candies make delightful Christmas trimmings. Wait until you unwrap them and put these delicious candies in your mouth. First, there is a rich covering, and a then a thick creamy center inside. Practically impossible to resist. Send a box as a present to a friend, neighbor, colleague or relative. Each szalon cukor is covered in delicious chocolate. Each bon bon "szaloncukor" is covered in delicious chocolate. and get any one free! Makes a great gift for friends, family or as a decorations! to get the 7+1 szalon cukor FREE! A great dessert. Give mom or grandma the day off. Beigli is made with the tasty mixtures of country-churned butter, fresh laid eggs, all natural flour, amber honey and delicious raisins. Otto's own imported fresh-ground walnuts or poppy-seeds are wrapped in a light delicious dough. Watch these mouthwatering ingredients melt-in-your-mouth. When refrigerated properly, this extraordinary golden brown goodness will stay fresh for quiet a while. Serves up to six to eight servings. Pop-into the microwave for a few seconds until slightly warm and it will taste like it was baked fresh on the spot. Open a window each day and receive a delicious piece of chocolate. 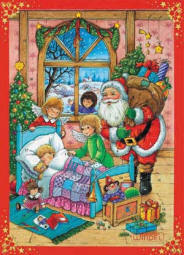 Lent calendars are a great way to count the number of days until Christmas. Great for Kids or Grandchildren! 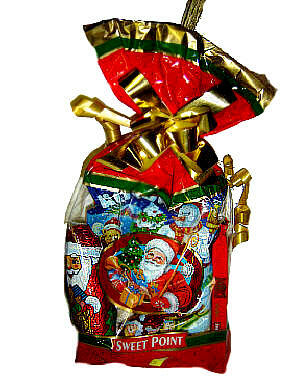 Includes fancy Chocolate Santa and gift packing. A great gift for kids or adults!! Hungarian Christmas Carols and traditional music.